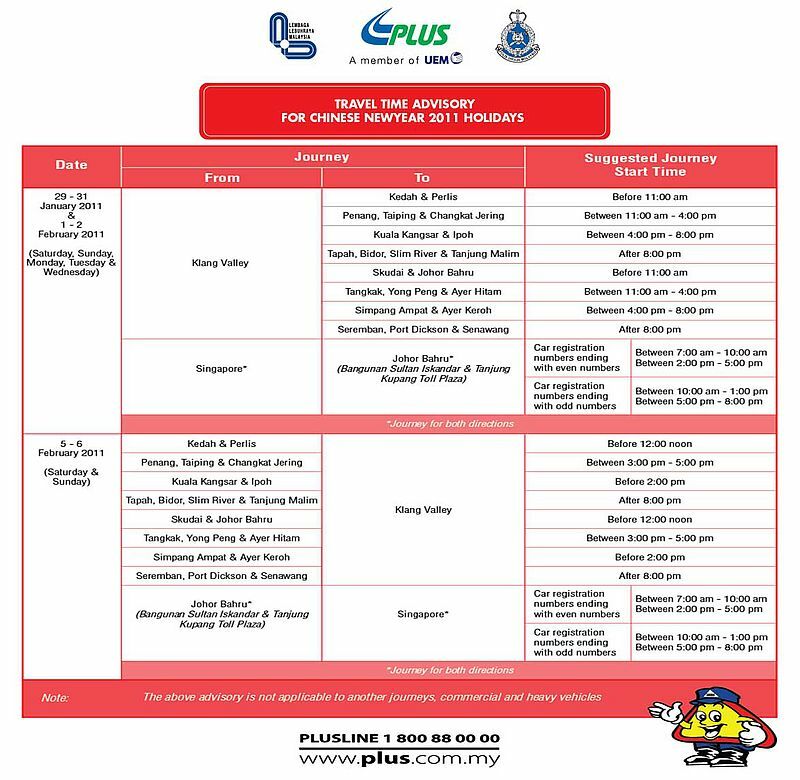 PLUS Expressways Berhad (PLUS) has issued its Travel Time Advisory (TTA) to ensure the public enjoy a safer, smoother and comfortable journey during the upcoming Chinese New Year. She was quoted at the PLUS media briefing to highlight the company’s preparations to cope with the increase in traffic during the upcoming Chinese New Year at Persada PLUS today. Also present was the PLUS Chief Operating Officer, Tajul Azwa Bani Hashim. According to Noorizah, the TTA is aimed at assisting the public in planning their journey for the upcoming Chinese New Year holidays. The TTA consists of recommended staggered travel times for various destinations from the Klang Valley to major states and cities in Kedah, Perlis, Penang, Perak, Negeri Sembilan, Melaka, Johor and Singapore. “It is aimed at distributing traffic and reducing congestion on the mainline, major toll plazas, rest areas and lay-bys during peak periods,” Noorizah said. The TTA was introduced by PLUS in 2007 as a travel schedule based on studies of travel patterns during festive seasons over the past years. It is also a major factor that contributes to smoother traffic on the highway during festive seasons. For example, during the previous Hari Raya holidays, approximately 50 percent of the users followed the TTA issued by PLUS. “As such, we urge the public to plan their journey based on the TTA as it has proven to be effective in facilitating traffic distribution thus, reducing congestion during peak periods,” Noorizah added. Reload Lane Closure Reload lanes on toll plazas will be closed on 29 January until 6 February to facilitate smoother traffic flow at toll plazas. Reload ’n Go Counter Reload ’n Go counters will be opened from 29 January until 6 February at 10 Petronas stations at selected R&Rs along the PLUS highways to facilitate highway users to reload their Touch ’n Go or PLUSMiles cards. Additional Personnel 25 percent increase in manpower at toll plazas. Approximately 3,000 personnel will be stationed at toll plazas this festive season. Toll Counters 1,000 toll counters will be opened to facilitate smoother transactions at toll plazas. Emergency Response Team 430 personnel from the Fire Department, Police, St. John Ambulance, Persatuan Bulan Sabit Merah and Jabatan Perkhidmatan Awam will be stationed at 12 strategic locations, 24 hours a day. Supporting Team 400 RELA members will be stationed at strategic locations along the highway, toll plazas and rest and service areas. PLUSRonda Unit PLUSRonda teams will be increased from 128 teams to 159 teams and conduct more patrolling along the highways thus, shorten their response time. Latest Traffic Updates through SMS Will be offered through the plusMA program. 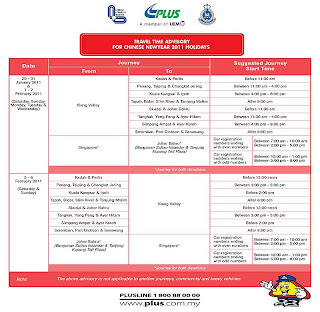 This time it;s Chinese New Year, the roads gonna be jammed up, so PLUS had issued a Travel Time Advisory (TTA). I seriously urge all Malaysians to follow this TTA, don't simply go about driving without knowing what time is the best. PLUS had done their research obviously.